When I was in elementary school the teachers would hand out peppermints before we would take our tests. They told us that peppermint was a brain stimulant, that it would help us think and concentrate. As a child, I took hold of the idea that mint somehow simply makes you smarter, yet now I am also concerned with having pleasant smelling breath when interacting with others, and as a result I consume a fair deal of mint, be it gum, Altoids, etc. It is therefore impossible not to notice the peculiar sensation one gets when drinking cold water after eating mint; as though the water is far colder than it actually is. I had never thought to question why this phenomenon occurs until this project put me on the lookout for interesting questions such as this. My first response was identical to that of any person with a question these days: Google it. I was unsure how to phrase this question, so I began “How does mint..” and Google filled in “make water colder”. The second hit lead me to a site called “Mental Floss” that provided a brief overview of the process that I was looking for; the page was titled with the simple question: “Why does mint make your mouth feel cold?” The page explained that the sensation is due to a specific protein channel in sensory cells called the Transient receptor potential cation channel subfamily M member 8, or TRPM8. 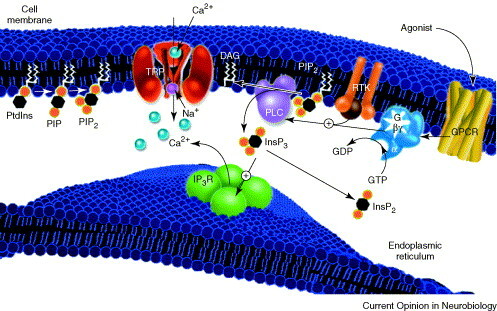 The page described that this protein is an ion channel, regulating the movement of ions across the membrane of the cell. In order to gain a better understanding of this protein, I dissected its name. Transient is defined as brief, temporary, or non-enduring. I can gather from this that the protein channel in question does not remain open for very long after receiving the stimulus that activates it. The page then goes on to explain that this channel opens in the presence of cold temperature, allowing Na+ and Ca2+ ions into the cell and sending the sensory message to the brain. Interestingly, it seems that menthol, an organic compound in peppermint and various mint oils, also activates this protein channel, leading to the “cold” sensation we feel when tasting mint. The page explains that the stimulus of something cold (i.e. cold water) on these already sensitized sensory cells will cause the neurons to fire again, causing the brain to be assailed with input from both the menthol and the cold temperature. 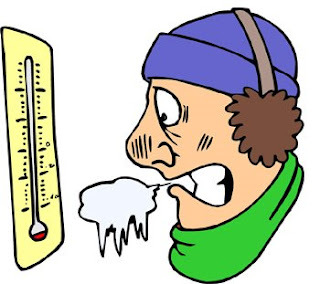 This “double dose” of sensory information is what causes the extra cold sensation. As interesting as this page was, it was not cited and raised a good deal of questions. How is it that menthol activates a cold sensitive receptor? How do receptors respond to a change in temperature? I retraced my steps to my Google query and searched for something more detailed and legitimate. I eventually stumbled upon a blog style article from a website called “The Science Creative Quarterly” in which all the information was nicely cited. This article (thankfully) agreed nicely with the un-cited information from the last page and presented a good deal of new information. Apparently, two separate groups of scientists identified the cold/menthol receptor and it therefore is named CMR1 in addition to TRPM8. This is the receptor that monitors temperature, and is therefore found all over the body. Upon reading this, I thought immediately of pain relief products, icy-hot for example, that induce a cold sensation after application. Sure enough, another Google search revealed that the main ingredient of icy-hot is menthol, whose organic structure is shown in Figure 1. Figure 1. The organic chemical structure of Menthol. Disappointingly, by the end of this article, I still had not learned anything about the actual process that occurs when menthol acts on the receptors and activates the ion channels. 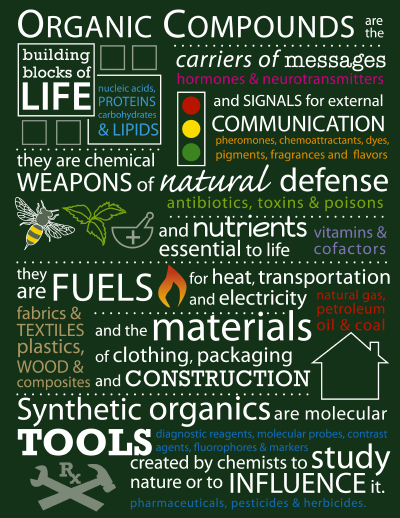 I required a more in-depth analysis of the actions of these cold receptors. I therefore logged into the University of Illinois’ library website and searched “menthol receptors” in the online journal database. I immediately found a nature publication from 2002 titled “Identiﬁcation of a cold receptor reveals a general role for TRP channels in thermosensation”. This article focused on the molecular and cellular mechanisms involved in how the body senses cold and how it responds to such a stimulus. They found that the receptors responded in a manner indicating that the menthol response is dose dependent. The results suggest that more than one menthol molecule is required for receptor activation. This was discovered by measuring the response current from the sensory cells while altering the concentration of menthol. As the menthol concentration increased, the current showed a sigmoidal shaped increase, as seen in figure 2. It was also observed that the current decreases in the sensory cells as the temperature is raised. The authors interpreted this data to mean that “increasing the temperature of the perfusate (from room temperature to 30o C) completely antagonized currents evoked by 100 mM menthol”. This, along with the data from Figure 2, led the authors to believe that there is a common molecular site of action for the menthol. Finally I was getting somewhere. One question on my mind, however, was how do we know that the same sensory cells are being stimulated by both cold and menthol? Couldn’t there easily be two different sensory cells reacting to the two stimuli at the same time? Thankfully, the authors of this article also addressed that question. They performed an experiment in which they lowered the temperature of the perfusate from around 35o C to about 5o C and observed the current activity in the sensory cells. This decrease in temperature showed an increase in current activity, indicating that these sensory cells do indeed respond to both the cold and menthol. Cold seems to have an effect on the conformation of the receptors, allowing ions through the channel and eliciting the sensory response in the brain. Heat was shown to antagonize the currents caused by menthol; this is likely a result of the increased temperature changing the conformation of the agonist or the active site in a way that does not allow for the exchange of ions across the cell membrane. As helpful as this article was, it still did not answer my question of how the actual menthol molecule interacts with the TRP channel. At this point I was feeling slightly exasperated, and attempted to broaden my search in hope of discovering any information on temperature affected ion channels. Unfortunately, this endeavor proved fruitless, as I found nothing applicable to menthol from these search results. It was with what must have been luck that I eventually stumbled across a helpful article after a desperate Google scholar search. The article was entitled “Ligand Stoichiometry of the cold and menthol activated channel TRPM8”. With a title this applicable, I’m honestly unsure how I missed this article before. The objective of this article was to investigate ligand stoichiometry of TRPM8 by creating tandem tetrameric TRPM8 contructs. This was done using a cloning technique in which wild type and mutant TRPM8 coding sequences were linked together. This is a way of characterizing the behavior of what is naturally a tetramer (TRPM8); now the researchers could alter subunits between mutant and wild type to gain a better understanding of the molecular mechanisms in this process. Using this technique, the researchers discovered some very interesting things. 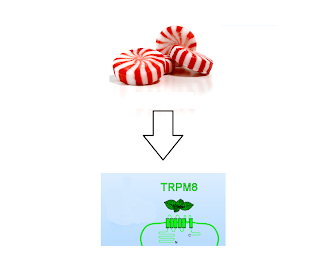 The results of the experiments with mutating the various subunits of the tetramer indicate that “up to four menthol molecules can independently bind to a single TRPM8 channel, and that each bound menthol causes a similar energetic stabilization of the open channel.” These results are in accordance with the conclusions of the McKemy article, which demonstrated the sigmoidal curve as menthol concentration increased (Figure 2). TRP ion channel in the cell membrane. Another of their more significant results is that they found: “menthol shifts the voltage dependence of channel activation to more negative values by slowing channel deactivation”. This is very significant to my question because it supports a claim made by the first web page I visited which stated that menthol acts on the receptors, leaving them sensitized for when the second stimulus is applied (i.e. cold water) resulting in the enhanced sensation. 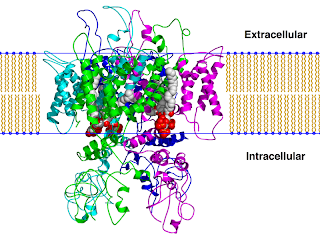 This mechanism of binding is very clearly different from the mechanism of cold affecting the TRP channels. This is why the sensation is increased when both stimuli are applied, yet is not affected after addition stimulation from the same stimuli (i.e. eating another mint). I finally have a solid understanding of how this particular phenomenon occurs, and continue to discover that this is a very common cellular action, as menthol is present in a great deal of products. It would be interesting to discover how many companies advertising menthol based products actually know how it functions. Soniak, Matt. "Why does mint make your mouth feel cold?" Mental_floss. N.p., 19 Apr. 2010. Web. 13 Mar. 2012. <http://www.mentalfloss.com/blogs/archives/52885>. Ting, Lillian. "Dude, You got some gum?" The Science Creative Quarterly. N.p., 17 Oct. 2011. Web. 13 Mar. 2012. <http://www.scq.ubc.ca/dude-you-got-some-gum/>. David D. McKemy, Wemer M. Neuhausser, and David Julius. 2002. 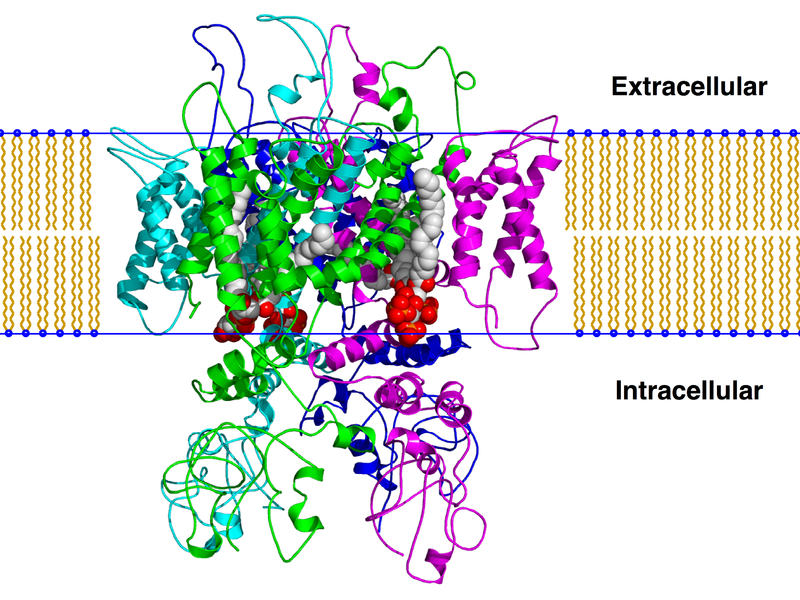 Identification of a cold receptor reveals a general role for TRP channels in Thermosensation. Nature 416: 52-61. Annelies Janssens and Thomas Voets. 2011. 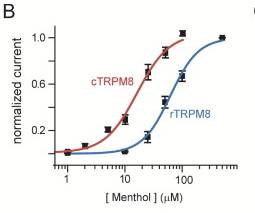 Ligand Stoichiometry of the cold and menthol activated channel TRPM8. The Journal of Physiology 589: 4827-4835. Great post! I thought your topic was very interesting and definitely a phenomenon that everyone in the class has probably encountered. I thought it was very interesting that menthol and cold share the same ion channel. I was, though, a little confused when you were talking about the 2002 article from nature, "“Identiﬁcation of a cold receptor reveals a general role for TRP channels in thermosensation” when they were comparing menthol to a perfusate...what exactly was the perfusate? And how did they isolate the channel? Does this channel become activated only when we ingest something cold or when it is cold outside like in the winter time? Also it would be interesting to learn about how the sensory channel sends a message to our brain telling us that we are feeling cold. Overall, I thought it was a very interesting post and definitely increased my curiosity in the subject! Great job! I really enjoyed this post, it explored a common phenomenon that I really had not thought to look at the reasoning behind. I however wondered at the overall action of the TRPM8 channel. Does it only work for cold sensitivity in the mouth region or does it work for temperature sensitivity overall? And then of course comes to mind the question of the signaling pathway that goes from the TRPM8 channel to entry into the nervous system. I agree with the above poster in wondering what perfusate was used as it seems to be relevant to examining the results. Overall the post was very well made and really followed a logical pathway to the conclusion stated. I really enjoyed it. I like how you showed how menthol can cause change in temperature sensation and how it also has an analgesic affect too. Its cool to see how it makes for a delicious minty taste while also relieving muscle pain. It is also fascinating to see how the change in temperature sensitivity can augment the analgesic properties, as seen in icy hot patches. This article in turn provided more understanding on how sensation actually works in our bodies at the membrane level of cells. It would have been nice to see how this menthol mechanism that you described came into play with all of the different uses of the substance, but overall I thought the insight you provided was really great.